WATERS SOUTH OF THE KOREAN PENINSULA - USS Warrior (MCM 10) successfully concluded a mine countermeasures exercise with the Republic of Korea Navy, March 29. 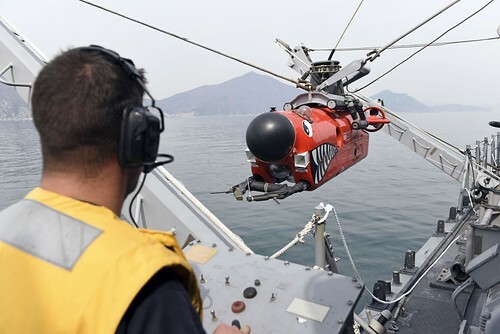 The exercise, designed to enhance the MCM warfare capabilities of both navies, was held March 19-29 off the coast of the southern city of Chinhae. Carroll stated that the Warrior, and other MCM class ships, give navies the ability to detect mines with sonar, disable them with neutralization vehicles, and sweep [search] for mines mechanically, acoustically and magnetically. During the exercise Warrior simulated and used inert mines but in real world operations an MCM would recieve information from various sources and be sent to a specific body of water where the mines are suspected to be located. The ship then begins to search, or hunt, the designated area for mines. “After our sonar teams locate possible mines, we classifying them by size, shape and deck department prepares the mine hunting equipment,” said Torres. MCM platforms like Warrior are equipped with an ANSLQ-48 Mine Neutralization Vehicle (MNV) which is used to disable mines by either cutting the mooring chain on moored mines causing them to float to the surface, or by cracking the mine’s casing which allows seawater to enter and render the electronics useless. MCM’s also have explosive ordnance disposal (EOD) lockers for EOD teams if necessary.